Perfect as a memorial or decorative keepsake, these delicate wind chimes play the first six notes heard in the opening measures of "Amazing Grace," one of America's best-loved hymns. A weather-resistant bamboo wind catcher adds weight to the chimes, and is enhanced by an engraved name, date or message. As the breeze caresses the wind catcher, the beautiful melody brings fond memories to mind. Select Standard 16" Chimes: Longest tube measures 7.5" and shortest tube measures 5.5". Or Select Large 21" Chimes: Longest tube measures 14" and shortest tube measures 10.5". Laminated Weather-Resistant Engraved Bamboo Wind Catcher. Free Engraving! Engraving area: Bamboo wind catcher. Maximum of two lines with up to 18 characters per line. Enter information to be engraved using the personalization option during checkout. Select from Two Measurements: 16" or 21". Amazing Grace Engravable Wind Chimes is a hand delivered gift. These gifts are delivered by one of our local design centers located throughout the United States and Canada. Same day delivery is available for most gifts when ordered before the cutoff time. The cutoff time for Amazing Grace Engravable Wind Chimes is 2 PM in the recipient's time zone. 16 or 21-Inch Wind Chimes - measured from top of hanger loop to bottom of wind catcher. Chimes play the first six notes in the opening measures of Amazing Grace. Complimentary engraving on weather-resistant bamboo wind catcher. Sent these wind chimes to my daughters in memory of their fur baby that passed. The girls LOVED them!!! Order was scheduled for Monday, but arrived early on Saturday. Great gift for the occasion. I've been giving this as a memorial gift and each and every time this wind chime has become a treasure to the recipient. The wind chime is well made. Sent this to a co-worker with sympathy for the passing of her mother! She told me they were beautiful and she loved the sound of the chimes. And she especially liked the engraving of the name of her mother in memory! 5-Stars! Mom absolutely LOVED her birthday windchimes. A perfect gift she hung in her screened-in porch where she spends a lot of her time. The engraving we chose was 'You Are Our Sunshine' because that is her nickname everyone calls her. The wind chimes are beautiful they sound amazing. Glad I decided to purchase these for a friend who%u2019s sister passed away. She loves listening to them. I have been ordering this chime since 2011. ALWAYS a great sympathy and memory gift for the receiver. Wish there were more lines for engagement of a date/year even on the other side. I ordered these for a friend. I did not give a proper address and I received a call within an hour of ordering. James was fan-flipping tastic getting a hold of me and getting the correct address. I callled back later with the correct information and he was very helpful in completing the transaction. He was very courteous and pleasant on the phone. Stellar job James!! Awesome company. I plan to use them in the future!! I've purchased several of these wind chimes for different people over the years, and always get rave reviews about how unique and lovely this idea is. Being able to engrave a name at the bottom makes it unique and special for each person. I'm also always impressed with how quickly these arrive after ordering them, even with the personalization. Thanks GiftTree! I ordered these for a friend who lost her son. They came in a beautiful package and she loved the personalized message and the sweet first six notes of Amazing Grace. I chose these for my friend whose dog had to be put down. She loved the thought. The wind chime was very well received. I visited the week after it arrived and I was very pleased in the appearance and overall good quality . It made a very very nice wind chime! This was the perfect sympathy gift for our family friend who's mother went on to Heaven. I am impressed with the customer service and quick delivery. I wanted to give something everlasting. When she opened it, she cried when she saw his name engraved. Beautiful memory. Thank you so much. The recipients of the wind chimes feedback was very positive. They said it made such a thoughtful gift and that it was very much appreciated. This was the second time we sent this out and are very pleased with the responses we received. arrived one day late, but intact, Thank you! My son loved this Wind Chime I purchased for his Birthday for GiftTree. Very well constructed, just beautiful. I have been sending this to friends who have lost a loved one for several years now. The sound is beautiful...such amazing grace! I love that you can personalize it. Everyone has been so appreciative and i always here from them of the great memories it brings when they here it. Great gift!! I will keep giving. I ordered this for a friend who recently lost her new born. I love the concept of the Amazing Grace sound. My order was received on time, beautifully packaged as well. I wish I could have heard the wind chimes before putting them in the mail. We have been sending these to clients who have lost a loved one. We primarily deal with retirees, so this happens quite a bit I'm afraid. When we first opened the business and we talked about what we would send and when, the death of a loved one was an obvious one to address (along with birthday's etc). We looked and looked; we knew for certain we didn't want to send flowers. It wasn't until nearly two years in business that we came across this and we have never sent anything other than this GEM from that day forward. The response that we get from the clients when they receive this is amazing. We have had almost everyone that has received one call us crying telling us how beautiful and special it was. PLEASE DON'T EVER STOP SELLING THIS. This gift goes so far and says so much. In my opinion, there is no other like it that will say what this gift says. Thank you GiftTree. Thank you! I ordered 2 of these for the children of a dear friend that has passed away. They were delivered within 2 days. The daughter was so pleased it brought tears to her eyes. I would recommend this product for a beautiful remembrance for the families of the deceased, in lieu of Flowers. On another note the clerk who answered the phone was very helpful and patient. No issues from order thru delivery!! Beautiful sound, engraving nicely done. Even arrived earlier than expected. These windchimes are awesome. I love that you can personalize them. They make a very distinctive, memorable gift for all occasions; birthdays, anniversaries or even as a memorial for a loved one. Would definitely recommend based on my recipient's reaction. This was an awesome gift in lue of typical flowers. This last longer and the free engraving made this gift even more special. It was received with great appreciation. Chewy's not gone, just passing. My Dog Chewy passed this month and it's been real hard on me. I received this as a gift from a wonderful kind person. I hung it very close to the house. Every time I hear it's beautiful chime playing I get a wonderful feeling of chewy passing in the wind. I cry but, it's a good feeling cry. One that comforts me. Thank you! I could have not received such a wonderful gift as this to remind me that chewy's not gone. He's just in the passing wind , always. I needed this gift delivered at the last minute and GiftTree came through! It arrived on time and my mother loves it. My daughter-in law loved it very much. Loves the sound and the way it looks. Beautiful. Both recipients absolutely loved the Wind Chimes. Had never thought of giving a gift like this for Sympathy, but they absolutely loved them. I'm going to order one for myself, just to hear them chime to "Amazing Grace!" First time using GiftTree and it was fantastic. CS was so helpful and nice and the chimes were engraved and delivered the next Day! I have told all of my friends about GiftTree! I have purchased these Amazing Grace Wind Chimes on two different occasions. A mother who lost her son and for a friend who lost his daddy. Both recipients absolutely loved them and said it was the most thoughtful thing they had ever received. I did get to see and hear the first one I purchased and I was in awe of the beauty and sound. This will be my go to instead of flowers in the future. They were shipped fast! I sent this to a friend whose father had died and had his Dad's name engraved on it. He was so touched by the gift and called me immediately to thank me. Since then another friend asked me where I had purchased it since she wanted to send one to someone. This is a great gift to remember the deceased. The bereaved families are very pleased. I sent this wind chime as a gift to a friend who had lost her beloved Dog. It just seemed to be the most perfect gift. She loved it!! The inscription was beautiful and the Chime song of Amazing Grace is what really made it a wonderful gift. I would recommend this as a gift for anyone and for any reason. I will be sending it again as a gift. The chimes were for a friend who just lost his mother and we had a favorite phrase of his mother's engraved. The chimes were beautiful and brought him to tears when he received them. Calling in my order was a breeze and it was delivered quickly. Sent it to a friend who lost her husband and she loved it. Thanks! I ordered this for my friend that had lost her father recently. She raved about it!!! Since her father was a woodworker, she especially loved that it is made from wood. I would highly recommend and delivery was very fast. I purchased this for my doctor who is very dear to me and just celebrated his 80th birthday. I was told the gift opening was quite an emotional moment and the amazing grace sounds are perfection. This turned out to be quite the spectacle in the office and I engraved it for that additional specialized touch. It had everyone in the doctor's office in tears. I was very pleased with the chimes. I was looking for something to send as a very dear cousin passed away. This gift was perfect for the family to hang in her garden. The chimes were so nice sounding. I ordered it very late for a Christmas gift and told the recipient I sent a gift and hoped they would understand if it didnt't arrive on time for the holiday. Arrived incredibly enough within 2 days of ordering and a few days before Christmas. The family loved it. I inscribed "Merry Christmas 2015" and our names. Amazing gifts, amazing service with emails being sent notifying us of every stage of shipping and delivery. It was my first time ordering from here and I am already online looking to send another gift. This product had high marks from other consumers, and it definitely lived up to it! I had the item shipped to a flower shop and they added it to a large plant on a shepherd's hook in the plant. This will make for a beautiful memory of a family member whose life was tragically taken by a house fire. The family expressed how beautiful the chimes were in memory of their daughter and sister. My daughter in law and her family loved the wind chime given in honor of their mother. Fast shipment was a plus. I was told the gift was beautiful. At the time, when I ordered the chimes as a sympathy gift, I did not know my cousin collected wind chimes. She was very pleased with it. Will be a great present! I sent this to my sister-in-law when her father passed away. I could not be there because I live in another state. She absolutely loves it and every time there is wind she will be reminded of the happy memories. She said it was beautiful and very thoughtful. Bought this for a gift for a co-worker in another state. She just raved about it!!! Also, she said it was the best give ever!!!! This was sympathy gift and the recipients were touched by this thoughtful and memorial selection. Product was shipped and received the day after ordering. Loved the engraving and the chime sounds beautiful! It is a perfect way to remember your loved ones. Sent The Wind Chimes as a Sympathy gift and the recipients were very pleased and said it was beautiful. I loved the product I purchased and it was delivered fast. Nice idea for a gift. This was purchased for my sister in law who lost her father. I have not seen it, but she loved it and said it makes her feel calm when she sits outside and hears it. She was very thankful for this gift. I'm very happy that I went with this idea. My dearest co-workers sent these wind chimes to me when my mother passed away last week. (She loved wind chimes). I own two very expensive larger sets of chimes that don't even come close to the sounds that these make. Every time I hear the angelic chimes, I picture my mother smiling. I will cherish these the rest of my life and would recommend these to EVERYONE. I ordered these for a friend whose mom passed away. She really loved it. She showed them to me one day when I was at her house and the quality was good. I have paid more for chimes for a funeral and not had them engraved, so I was thrilled with this product, and just ordered them again for a family members death that was out of state. Sympathy Gift For Dear Friend. Bought this for our dearest friend who lost her husband. I have not visibly seen it, but she called and absolutely loved it! She really loved the personal inscription on it too. I did not see the wind chimes, they were sent to the recipient as a sympathy gift. I purchased the amazing grace wind chimes and had them engraved with my friend's mother's name and date of death. My friend called me later and could not express enough how beautiful, heartfelt, and meaningful the gift was. It was the perfect gift for a long time family friend who lost her mom at the age of 94. I have purchased too many of these beautiful wind chimes, for me to remember just how many. So far, all of them have been well received by each recipient. I live too far away from most of them, but have not heard any complaints. I did notice on one I purchased for myself, in memory of my brother who passed away in Feb., 2015, that the engraving of his name and 'in memory of' was not as dark as the others that I have seen. I hope it will not be more likely to fade, in future years, as I am not an 'engraver' and would never do justice to that. The wind chime was for my very dear best friend whose father passed away. When she opened it, she was amazed at how beautiful it was! The sound was very moving from the chimes. And I even engraved it. SHE LOVED IT!! It hangs on her tree by their lake and it will always remind the family of their wonderful father/grandfather. I am very impressed with the quality of my purchase. First time buyer from GiftTree, but definitely will not be my last time!! Thank you for great service and products! Shipping is super fast. Products easy to order. Loved that these could be personalized, but needed a few more characters. Was very difficult to fit anything meaningful. For the sympathy or funeral category, I'd like to see a few more gifts that aren't floral/plant related, maybe a few Christian choices? Second time customer, plan on coming back! Sentimental & lovely for sympathy gift. Such a fantastic gift to express sympathy! These wind chimes are just lovely! I didn't get to see the windchimes; however, the recipient sent a thank you note that said "wow, so special"! I have not seen it but my friend loved it! I received the windchimes in a very timely manner. I love the look and the sound of them. I am very pleased with my purchase and I thank you so much for offering such a lovely gift for me and my family. Loved them, received this from a friend when my Dad died and just love them, I am sure the recepient loved these also. I have sent the wind chimes to two of my friends who recently lost their fathers. They were moved to tears because it was so different and reminds them of their loved ones every time they hear the chimes. I ordered this for my sisters birthday. Our mother passed away several years ago & one of her favorite songs was Amazing Grace. My sister absolutely loved it she said she cried when she opened the package. I live in another state but she sent pictures of it hanging in patio. Very happy with this product & will be a repeat customer with GiftTree. I opted to order these instead of the usual flowers for a friend whose dad recently passed away. He absolutely loved it and thought it was such a wonderful way to remember his dad when he heard them chime. It is also a really nice touch that it can be personalized at no extra charge. I would definitely order this again. The recipient was overwhelmed with the beauty, the sound, the quality, and the promptness of receiving the Amazing Grace Wind Chimes. This was a gift for my mother. She loves the chimes! I hung them up the day she received them, and was sad that there was no wind that day. She said the chimes seemed to be of good quality. Creating it was easy. it's a very unique gift. it was delivered. HIGHLY recommend. We sent this to my sister & husband for a gift to welcome them to their new home. It was very beautiful and chimes are exactly as described. Great choice!!! This is a wonderful gift for a funeral, this company is superb in communicating when the item is shipped and received. I sent to my niece in law when she lost her mother. Wonderful experience and will use this company and buy the chime again! Awesome product-really fast shipping-beautifully gift-wrapped too! After receiving these chimes from a friend, after my mother's death, I immediately ordered the same gift for another good friend, who recently lost his father. His father was a soft spoken man. My friend will hear the soft whispers of his father each time a breeze sways the chimes. So much more personal than flowers. Not only was this received super fast, but the lovely personalization made it that much more special for my dear friend who lost her mother; and her mother loved wind chimes! This made it even more special! The tone is literally angelic! Thank you for the fast shipping, beautiful gift and perfect personalization! Highly recommend this gift! We continue to buy these beautiful wind chimes for members of our team when they lose a loved one. Such a great long-lasting option, rather than buying flowers. I ordered this wind chime delivered to my brother in the hospital and he was so pleased. The chimes truly do sound the notes of "Amazing Grace", and are a reminder of the beautiful sound of God's love. I'm so glad you offered this lovely gift at a reasonable price. This was sent to another state for a friend. The shipping was very fast and they were extremely impressed with this item. I could not have been more pleased with the customer service, as well as the product I purchased. I had purchased the wind chime, it was engraved and shipped all in a matter of 5 hours. I would not hesitate to use and recommend GiftTree.com. I'm happy that the recipient received the gift on time. I have bought this for the parents of my best friend who passed away unexpectedly. This is one unique way to give an everlasting gift to someone to remember their loved ones. Each time the wind blows the chimes will sound letting you know that your loved one is around. I bought these as a gift for a beloved friend. We are sisters of the same thought. She loves her chimes. As usual GiftTree did not disappoint. The perfect gift for my friend who lost her father. I was looking for something more lasting and special, flowers were more expensive and just wither away. I engraved with his name and a quote, not the date of loss. She and her family loved them, the sentiment and just could not stop saying how special and meaningful to the family it was. Definitely consider them! I bought this for my best friend who just recently had a death in the family! He was very touched as well as his family. The "Amazing Grace" tune is beautiful too!! They were a gift for a dear friend who lives states away. She called me immediately upon receipt of them, and was extremely pleased and also touched by the personalization. My dealings with GiftTree were excellent and I was impressed with the speed in which the order was processed. The chime was well received. The family was thrilled with the chime after the loss of their mother. I am pleased to say I bought these as a Christmas gift for a very close friend and she liked it so much, I already received a thank you card! The wind chimes are beautiful and I look forward to hearing them chime in the near future. Thank you GiftTree! The shipping was perfect and was delivered on the date expected. Although this is meant to be a gift given in remembrance we gave these chimes to my mother as a Christmas/housewarming gift. She loved them. They are beautiful with a lovely intonation. I have never experienced a company that is so intent on getting it right the first time! How nice! I sent this to my friend who lost her Mom. I had her name engraved on it. My friend loved it and was so thankful for it. Very nice gift and engraving! This was given to a family of a dear friend of mine who passed away. The chimes gave special meaning to her mother. My friend absolutely loved this! This was given to a friend who recently lost her father. We had it engraved and it was delivered the day after we ordered it. My friend loved it! Company called me the day after it was delivered to check on the product and sent me an email. Excellent customer service!! I bought this for my Aunt when my Uncle passed away suddenly. She wrote and said she loved it and was reminded of my Uncle whenever she heard it. I received this as a gift for my fathers passing. I thought it was beautiful and very thoughtful. The person I sent it to loved it, and hung it up right away. I sent this to a lifelong friend who lost her father and she loved it. She had considered buying it for her father for his next birthday or Christmas but didn't have a chance. I had no idea. Now whenever it chimes, she'll think about her dad and smile. My wife is very happy with the Wind Chimes and I will soon be ordering the larger version. Thanks! When flowers are not an option... or even when they are! The best review I could write is the actual quote from the thank you note I received - "The chimes arrived today!! Oh my gosh they are so incredible. Amazing Grace? I showed my son, he was skeptical, until he heard it and recognized the tune. How DO they do that? It is truly inspired. Thank you so so much for this heartfelt gift!" I'll be considering these chimes for other situations now. Thank you, GiftTree, I'm SO GLAD I found you! I received this as a gift when my dad died and it was such a pleasant gift. I will think of him every time it chimes. I sent this to my good friend and her family after the loss of her mother. It was very well received. This is my go to gift! I have sent this to about 6 or 7 co-workers who have lost loved ones and every one has raved about how thoughtful and beautiful the gift was. Every time they hear the chimes it reminds them that their loved one is watching over them. Can't say enough about this beautiful gift! This was sent as a bereavement/remembrance gift and both ladies were brought to tears when they received them. Perfect gift to remember a loved one. Unfortunately I have had two close friends pass recently. I purchased this windchime for each. Family members loved the gift and were amazed at how quickly they arrived, personalized. Thank you GiftTree! As described! Beautiful! Fast shipping! Great product! Superior service! The chimes arrived on time and in perfect condition. My friend really liked the wind chimes. Better than flowers. This will last much longer than flowers. I think this is a perfect gift for someone who has lost a loved one. I have purchased this for so many people in lieu of flowers. It works for pets - and humans. :) It is a sweet gift that they can treasure. The recipient said it was absolutely beautiful and that the sound was exceptional. The gift arrived on time and the recipient said they have a beautiful soothing sound. I will probably send them again to someone. Sent this to my sister-in-law when my brother passed away. She absolutely loved it. The sound of the Chimes is so calming. We have sent this to our clients that have had a death in the family and all are so appreciative of it. It's a reminder of their deceased love one every time they hear the chimes. Ordered as a sympathy gift -- this is actually the 3rd time we have ordered these beautiful chimes -- all the recipients have really loved and appreciated them -- in fact, the friends we just sent the chimes to said that "Amazing Grace" was the only music their Mother requested at her graveside service. Thanks for a very nice product, they are a wonderful, lasting alternative to many other condolence gifts. I sent the wind chimes directly to my Mom so I never saw it, but she said it's very nice... and I have no doubt it is. GiftTree is the best! EXCELLENT variety of gift options, decent prices and prompt shipping! I always trust the gifts I send from GiftTree will be of high quality. Sent to friends after the loss of her Dad. She loved it. Amazing Grace was played at the funeral which made it very special to her. I didn't see the wind chimes since I ordered online and they went directly to the recipients. However, they called to thank me and said they LOVED the wind chimes. I will definitely order these the next time I need a sympathy gift. Thank you for your fast service! I order by 3:00 and they received them next day by 11:30. Amazing! I have purchased this item twice now as a sympathy gift and both times have been told what a great gift it is. It lasts longer than flowers and the chiming is calm and relaxing and nice to listen to and remember happy times with your loved one. I have given these chimes on several occassions when someone passed away. The receiving family has always been so touched and grateful. Gifttree also does a great job of offering prompt delivery. Sent these wind Chimes for a friend, who Father passed away. Now when it chimes He can hear his "Father" speaking to him. The Wind Chimes made a pretty nice and differant type of gift. I sent them to my husband for always doing so much for our family....hey if he was my wife I'd send flowers, so decided on the chimes for a guy instead. he hung them on our porch and enjoy's relaxing outside and listening to them! I bought this for my Mother's birthday and she loved it. She was very excited to hang it. She also commented on how the packaging was very nice. It arrived on the day expected in good condition. These wind chimes are my preferred choice as an expression of sympathy. First, they last much longer than flowers. Next, they are a gentle reminder of their loved one. Last, many families are choosing 'No Flower' services and it is difficult to show that you are thinking of your friend or co-worker - the wind chimes give you an opportunity to send your sympathies directly to their home at a later date. The chimes were an excellent gift In Memory of my friend's soul mate. It is a cherished remembrance of their time together. She is truly touched. Highly recommend working with Gift Tree. I have purchased these wind chimes 3-4 times now as a sympathy gift. I present them with the idea that the sound of the chimes will be a sweet reminder of their loved one who has passed away. The recipients always love them. Passed so fast from Cancer at 42. This is a show of our love for her for her husband to always remember she was a Special Woman'This had Amazing Grace on the pipes and she passed with a lot of Grace and this was a perect gift. I would recommend this as a gift for a wonderful memory of anyone in your life that may have passed whom was Special. I can purchase these locally, but only the GiftTree.com offers engraving. The personalization moves the gift from elegant to breath-taking. I am never at a loss for gift giving...house warming, new baby, wedding, death...this gift is appropriate for all occasions. It brought a flood of tears to the recipients who lost their son. Very touching gift that will be treasured for years to come. I did not get to see the chimes since they were a gift but the recipient said they were really nice and had a great sound/tone. I sent this gift to a friend whose father passed away. She was very touched by the wind chimes and the personal engraving. She called me and said they were lovely. I will send this gift again. Loved the gift memorial and immediately purchased one for a colleague who had lost a parent. I have purchased wind chines 3 times previously for bereaved staff members. Each time they were absolutely overcome with gratitude and appreciation for the thoughtful memorial to their loved one. This was a gift and the recipients loved it. It arrived quickly. Have bought from GiftTree.com before and have been very pleased. My daughter thought this engraved sympathy gift was beautiful and amazing. Wanted to send my brother and sister in law something that would catch their eyes as well as their ears because they went out of their way to do us a big favor. They were surprised and delighted. The engraving topped it off. Very lovely chimes made very special by the engraving! A great way to remember a dear friend who has passed away. I had these chimes engraved to memorialize the loss of our friends' pet. I was looking for a unique gift to express our condolences, and these were just perfect. They arrived as promised, and as a first-time GiftTree customer, I have now bookmarked this site as a favorite. I chose this chime for our son and daughter-in-law as a remembrance of her grandmother. They said it is beautiful, and was especially meaningful as Amazing Grace was played at the end of her funeral service. Wanted to give a lasting gift-this was perfect in every way. Absolutely beautiful, I ordered this for my boss after her father passed and she loved it. I have sent the chimes as gifts for a wedding and a new home. In both cases the chimes were really liked. The personal touch of the engraving is an added perk. Easy to order and track. Even notified me that the address of the new home could not be found & asked me to contact them with additional info. Items were delivered as promised. I sent the large one, and I engraved it with reference to the lyrics of Amazing Grace. The receipients are family that are struggling through some serious things, and this gift was meant to provide daily inspiration. It was a big shot in the arm for them, and I believe from their response that it will continue to help them focus on the good stuff. She said it was beautiful, and she seemed impressed. They were exceptionally pleased and movedby the gift. It does come with information explaining the connection to Amazing Grace. Recipient was partcularly blown away by the inclusion of her name on the engraving. I don't think she realized I wrote the whole thing, but I'm not worried about it. I just want her to be happy and feel loved. Money may not buy either, but a touching gift like this sure sends the message I was looking for. Thank you for offering this very cool gift! I sent this wind chime as an "In Memory Of" gift to my sister-in-law who lost her father. It was very well received. She was so touched by this gift, especially because at the memorial they sang Amazing Grace. I didn't know that since I live out of town and wasn't there. She told me it really does sound like the beginning notes of Amazing Grace. Her family hung it on their covered porch as soon as they received it. That tells me they really liked it! This gift made the recipient cry. Thank you for helping me send something beautiful and thoughtful. Will be using you again in the future! I bought this for my brother-in-law when his sister passed. He thinks they are wonderful and when they play, he feels very comforted. I sent this without seeing it but my friend loved it. I won't hesitate to order another one in the future. The response I received was so nice. It really is that perfect gift. You can't go wrong with this one. I send this gift to my employees who have lost loved ones and have the chimes engraved, 'In memory of . . .' with the loved ones name. All who have received the chimes have been happy to have a gentle reminder of their loved one. Very courteous and fast delivery. The wind chimes looked better in person than they did on the website. The chimes arrived on time as promised and was beautifully wrapped in a nice box with a red bow, which I was not expecting. That was a wonderful added touch. The chimes sounded very nice but I couldn't quite make out "Amazing Grace". I think you have to hit the chimes just right. All in all, this was an amazing gift and I will definitely buy again. I originally bought this item for myself. However, I loved it so much that I have purchased several as gifts for family members since that time. I opted for the gift-wrapping each time and have not been disappointed. I highly recommend this chime. This is an Awesome Gift - this is the third one purchased. I love Giving this instead of flowers when there loved ones pass on. They can enjoy it for years to come. And the Engraving is a Perfect Personal Touch. This was a gift for a friend who lost her grandfather. My note card said for her to remember him when the wind blew through the chimes. She absolutely loved it. The engraving is beautifully done. We bought this gift for my mother for Mother's Day. My daughter's name is Grace. She absolutely loved this gift. I bought this as a Mother's Day gift and my mom loved it. It was just the right size to hang by her kitchen window so she could hear them all the time. We purchased this for a co-worker whose Mother had passed away. She loved them. This is a much more personal gift than the traditional funeral flowers. I bought this for my friend who lost her grandmother. I had her grandmother's name printed on the chimes. It was so well received - she loves it. Good price and delivery. I was very pleased with the chimes I ordered. I placed my order late on a Tuesday and the box, with engraving, arrived by noon on Friday. I had the gift delivered to my house to give to the recipient and they even checked to make sure that this was the right address. I was very pleased with the workmanship. The person to whom I gave the gift was very touched. I purchased these for my mother for Mother's Day and she loved them! She said they were beautifully engraved and had a lovely, warm sound. Had never thought of giving wind chimes before but absolutely love it now. The sound is great and the engraving makes it so special. Will totally do this again for others. So glad I found your product. What a great way to share and important day with someone. This was for a retirement gift. She loved how the sound as well as remembering the special day. Had a Stronger Impact than I Expected, Loved it! My Dad couldn't stop saying how much he loved this gift I sent in memory of his Mom whom had just passed. He said how uniquely beautiful the sound was, and was so impressed that he asked me to send an additional set to another family member. This gift made a stronger impression than I expected! Such a lovely gift! I recently bought 3 of these wind chimes and every person that received them just raved about them. The wood is so beautiful and the sound of the chimes is wonderful. I would buy this again for anyone. The sound of the high quality chimes are so enchanting. Then not only does the chimes sound great, you get to personalize the hanging wooden piece at the bottom. This just makes an ideal gift for anyone! We received the wind chime as a memorial of my mothers passing. We loved it so much, my wife and I sent one to my brother and sister. I have ordered this twice as a sympathy gift and recipients were very, very grateful. While flowers or a basket are nice, the chimes are forever. My last recipient said it's the kind of gift that will get passed on through generations to honor the memory of loved ones. Sometimes you want a special gift for a special person. I got this for my friend whose nephew died of an aggressive cancer. It chimes "Amazing Grace" and can be engraved. I had it engraved with his name and "Always with us". She loved it so much she immediately ordered one for her sister. I recently purchased this item in combination with a wine basket for a friend who lost his mom. While I have yet to see the actual item, my friend seemed very pleased with the wind chimes. Flowers are lovely, however, I like that every time he hears the chimes, he knows his mom is still with him. Very nice idea. The windchimes arrived on time and were just perfect!! We had them engraved as a remembrance for a friend who had just lost his father. Thank you so much! Loved ones. Everyone loves them! Beautiful sound as if playing Amazing Grace. This is the best non generic gift, especially for sympathy. Love these, so pretty and great presentation. Have not seen it, but recipient loves it. I purchased this as an alternative to funeral flowers. The recipient absolutely loved it and was very moved by the sound and how beautiful the chimes and the engraving were. Arrived quickly and on time, as promised. I bought two of these chimes for my cousins to remember their dad (my uncle) who recently passed away. They really liked this gift and think of their father when the chimes ring. My friend loved it. She said it was the BEST gift she received all day. She said she she hung it out her kitchen window and everytime she hears/sees it it reminds her of her brother. Delivery was super efficient and timely as well! I haven't seen it but the family I sent it to loves it. I ordered this for a co-worker after the loss of her mother. Someone called me from the company 5 minutes after I placed the order. She verified my order, and it was shipped out the same day. It arrived on time in a beautiful box with a ribbon. My friend really appreciated the personalization of this gift. My uncle passed away on a Wednesday. I ordered this Thursday and it arrived ENGRAVED on Friday! My aunt & my uncle's children were brought to tears then smiles. The chime went immediately on the back porch where they can all hear it's sweet sounds. I was very impressed with the quality and the timeliness of shipment, confirmation, etc. I highly recommend this product and the excellent service from GiftTree. I will definitely order again! I was given these lovely chimes in memory of my 18 year old daughter.....So much better than flowers. I also bought them for a family who lost their young mom to cancer....absolutely beautiful. Very Well Received!!! Beautiful, soothing sound. I happened to spot this and took a chance ordering for a friend of mine that just lost her brother. What a phenomenal choice! She just LOVED it!!!! I can't wait see it myself. She also said the sound of the chimes is so soothing. A friend of mine gave me these chimes when my 18 year old daughter passed away. So much better than flowers or any other gift. Now when I see them or hear them, I'm reminded of my beautiful daughter and her song plays in my heart. Such a special gift of remembrance. This is the third amazing grace chime that I have purchased. Each and everyone that I have sent have told me how beautiful the quality was and that it is hung in each of their homes and when it chimes the warm and comforting feeling they all feel. I know I will be order another in the future. I felt this is a wonderful memory to send to someone who has had a love one pass on. Ordering was so easy. Requested from Indiana and had shipped to Maine to my daughter-in-law. She lost her 98 year old Nana and absolutely loved the engraved chimes that played Amazing Grace. She said it was beautiful and made her cry. I will definitely order from you again. I got this for a Birthday gift for a friend. She loved it. I had it engraved with there last name on it. I will recommend this. I got the 21 inch for there back deck. Instead of sending flowers for memorials/bereavements, I began sending these beautiful chimes instead when our employees lose a loved one. They are SO well received and have caused quite a few tears for the recipients. I myself received one when my Grandfather passed late last year and I LOVE it! The packaging that it is stored in is beautiful as well! GREAT PRODUCT! This was very nicely done and greatly appreciated by the receipient. We had the sift with in 24 hours of ordering it which made it possible to present the gift at the memorial service. I gave this to my parents for their 60th wedding anniversary. I wanted to give them something other than flowers or fruit. They loved this windchime! I had it engraved with "60 Happy Years" on one side and the current anniversary year and date on the other side. I think it was the perfect gift! My friend loved it. I think this is so much better than flowers. Happened to be her day's favorite song as well. This is a great gift to send to someone that has recently lost a family member! It is a beautiful wind chime and it's nice that you can engrave a message or name on it. I got these for my daughter in law for her birthday, they are very pretty & have a great chime to them. As I ordered this on the Internet, I am unable to comment on the quality of the product. I do know the receiver greatly appreciated it. I was extremely satisfied with the delivery time of this gift. The item was engraved and shipped the same day it was ordered and delivered within 2-3 days. I was extremely pleased and wouldn't hesitate to order from this company again. They provide exceptional service. I was on the phone with my friend when she received the gift. She kept saying how beautiful the wrapping was. The gift itself was great quality and sounded perfect. We were both satisfied . I SENT THIS TO A VERY DEAR FRIEND WHO LOST HER GRANDMOTHER. SHE WAS HEARTBROKEN. I WANTED TO SEND HER SOMETHING THAT WOULD GIVE HER A SWEET MEMORY. THESE CHIMES DEFINITELY DID THE JOB. SHE WAS IN TEARS. SHE LOVED IT. THANK YOU SO MUCH FOR BRING COMFORT IN A DIFFICULT TIME. Have sent this chime to a number of people who value it's lovely chords and the message on the chime. 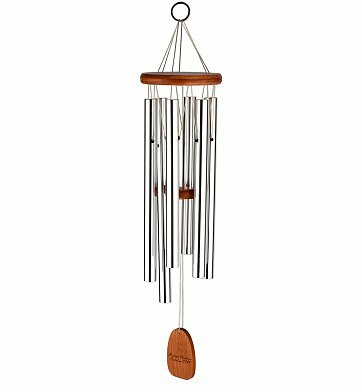 The memorial chime was the perfect gift that can be enjoyed for years. Beautiful sound and the engraving looked good too! Two months ago today I lost my sister completely unexpectedly and it hurt deeply. A friend sent me this windchime with the words "always loved, always remembered" engraved on it. This is such a wonderful gift idea. It means so much and every time I hear it chime I know this is my sisters way of talking to me. Such a wonderful way to remember someone, such a different and unique gift compared to the typical flowers. This past December, my husband and I lost our infant son. He was our only child and it was an incredibly difficult time to say the least. When Mother's Day rolled around, my own mother gave me these chimes. They are beautiful, both in appearance and sound. She engraved the chime with our son's name and birth date along with the words "always loved". Right now the chimes hang next to our deck, but will eventually go into the memorial garden my husband and I are planning. We are so pleased! I would recomment these wind chimes to anyone looking to send something differnt at the time of loss to family or friends. I have sent these and have been told they are beautiful. I received this gift when my mom passed away. I LOVE the chimes especially the personalized message. We received other chimes but the personalized message along with my mom's date of birth and death made it much more special. I sent the Amazing Grace Engravable Wind Chimes to my Aunt when her son was tragically killed in a motorcycle accident. She called me in tears. She said the chimes were so much better than flowers because they would last for years. And asked that I please call all who had donated to the gift. I will recommend this site to everyone! Plus you delivered a day early! Thank you so much for a job well done. This chime was appreciated the most over all the flowers, fruit and cards since it will last forever. Great quality. Great sentiment. Timely delivery. Thanks for the idea! I had not ordered a gift in a timely manner & really needed this unique item delivered quickly. Of course, I paid for the expedited delivery, but it arrived ON TIME! And was very much appreciated. Since it was a gift, I have not seen it, but I do appreciate the prompt service. I purchased this gift for my parents for their anniversary. I had their names and wedding date engraved on it. They loved it!